Crude polysaccharide from seaweed Ascophyllum nodosum (SCP) was digested enzymatically using cellulase and pectinase followed by lactic acid fermentation by Lactobacillus plantarum or Enterococcus faecalis to obtain crude polysaccharide hydrolysate (SCPH). The total carbohydrates of SCPH (26.76%) were higher than SCP (22.68%). The sulphate content (which indicated sulphate ester groups of sulphated polysaccharides such as fucoidan) was higher relatively after enzymatic and lactic fermentation (from 17.14 to 25.36%). Fourier transform infrared spectroscopy-attenuated total reflection (FTIR-ATR) spectroscopy established a peak between 1228 and 1226 cm-1—which indicated sulphate ester groups, a component of fucoidan—was observed in all A. nodosum polysaccharides but not with purified alginate. Peaks at 814–817 cm-1 indicated also monosaccharide-linked sulphate groups—located at C-2 and C-3—which again highlighted the presence of fucoidan. The capacity of these fragments and other seaweed carbohydrates (alginates) to lower blood glucose was ranked in the order ‘hydrolysed’ alginate, native alginate, SCPH and SCP. Hydrolysed alginate fed to rats produced the greatest quantity of acetic acid followed by native alginate, SCPH (by L. plantarum), SCPH (by E. faecalis) and SCP (23.62, 18.02, 14.95, 14.04 and 12.10 mM respectively). 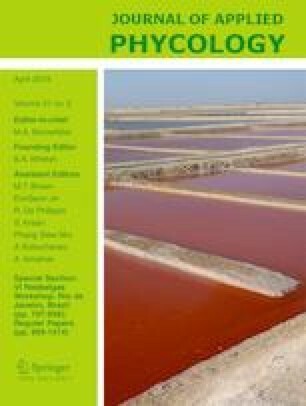 Hydrolysed alginate and native alginate showed better potential gut health benefits (prebiotic properties) in terms of either gastrointestinal (GI) transit resistance or SCFAs production compared with crude seaweed polysaccharide due to the higher percentage of polysaccharides. A novel process to produce seaweed polysaccharides with beneficial bioactivities was proposed. The authors are grateful to Ms. Hong Guo (Edinburgh, UK) for collecting the seaweed. This study was partially supported by a grant from the International Affairs Division and Kasetsart University Research and Development Institute, Kasetsart University, Thailand.